During the 1970s and 1980s I did a lot of hand embroidery: crewelwork, counted cross-stitch, needlepoint, and Christmas tree skirts and stockings. At the Northwest Quilters Show last spring I spotted three Christmas stocking kits circa 1990s at the show’s Bid and Buy table. My nephew Nick has three children, two boys and a girl, ages 3, 2, and 3 months. I decided the number of kits was a sign, and I needed to stitch a keepsake stocking for each. Well, I finally got started on the first one this year on a recent Saturday when we lost power for the entire day. The stocking was the only thing I could think of to do that didn’t require electricity or good lighting. I sat at the dining table near a bank of windows and started cutting felt and sewing on beads and sequins. Working on the stocking over the past few weeks brought back memories of stitching craft projects during my lunch hours or in the evenings after work and when my son was in bed. I only do original work these days, but it’s relaxing to do something that takes little thought–and is rather zen. My goal is to get the other two stockings done so I can present them for use this holiday season. 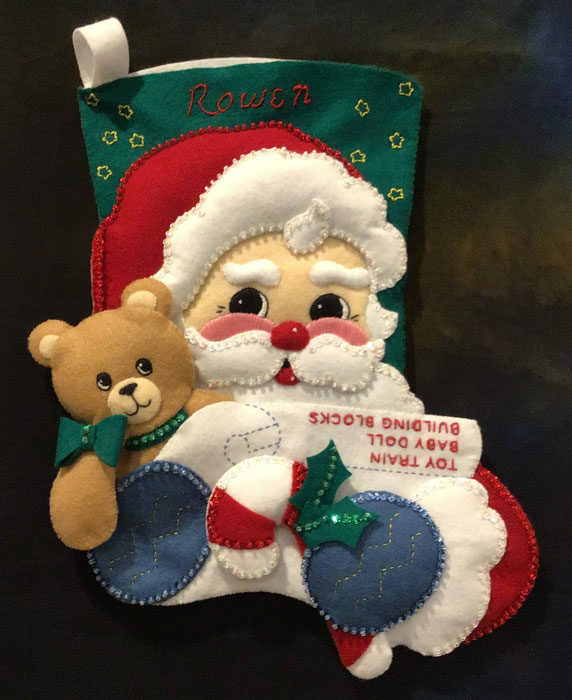 This stocking is for Rowen, the baby and the only girl. When I have a break in my two current quilts, it’s onto one of the boys’ stockings.